Once again, when choosing something to draw think of your composition. In this case the drawing looks interesting because it is half peeled and a few single orange sections have been set aside. It is important also to leave a lot of clear white within the orange for contrast. The little dots I usually do with an embossing tool. 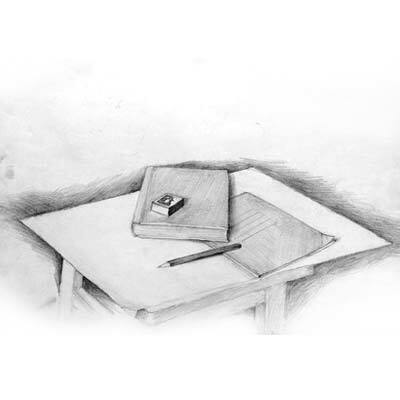 If you do not know what that is, look at my art material glossary page. The tool presses small round indents into the paper which makes it easy to draw over it leaving clear white dots. 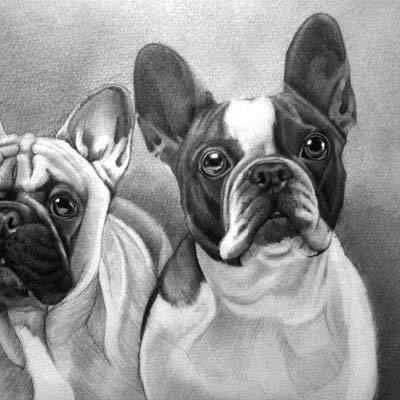 The main idea about this drawing is to add fur that has almost no fur lines but is drawn as masses of tonal gray-scale. Today we are drawing on gray paper with pencil and a white coloured pencil. Although this images has been digitally produced it is suitable for a good drawing. Notice that precise lines have been used in the focal point area and rather sketchy loose lines in the background. Such a simple item can be such good exercise for drawing. The drawing works well because the background is a softer midtone and the compass itself is greatly contrast rich displaying both almost complete black and very light areas. 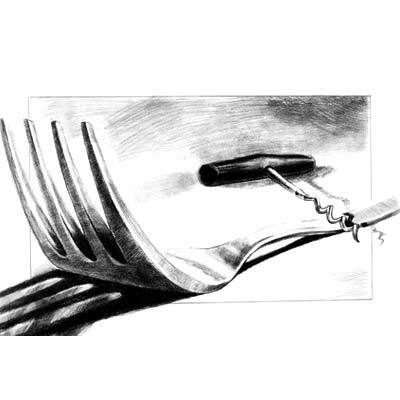 This image depict drama by drawing the fork in such foreshortening way. 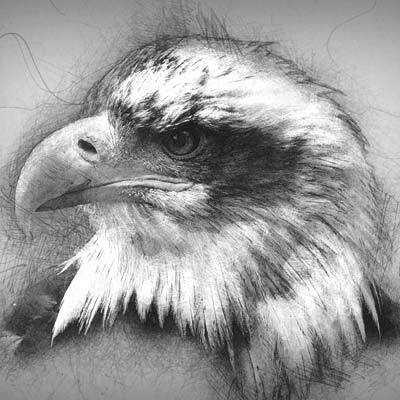 You could do this type of drawing to endless other simple objects and would always create an impressive drawing. This drawing will take at least two days, so you might want to finish it on your catch up day. Notice that the face is quiet foreshortened. Imagine the line on which the eyes are place and see that the mouth is much straighter in comparison. 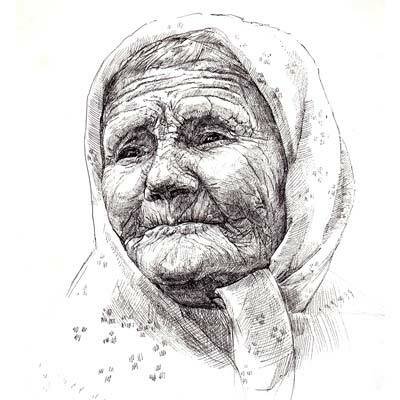 This portrait could be done in pencil, pen or ink. 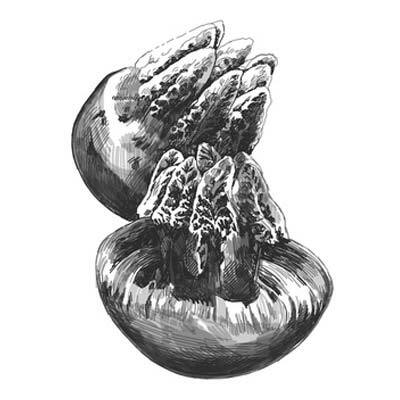 In pen or ink you have to do create the features with cross-hatching. Those good old wooden toys are brilliant things to draw. 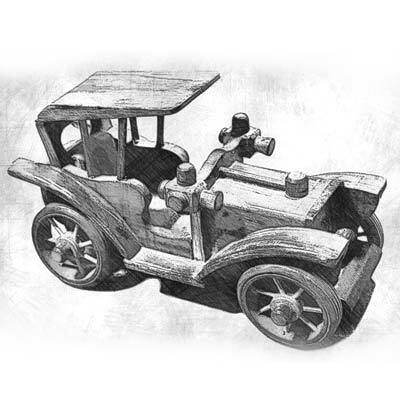 So today we are doing a wooden car. Create outlines with line contour variations and add all mid-tomes. 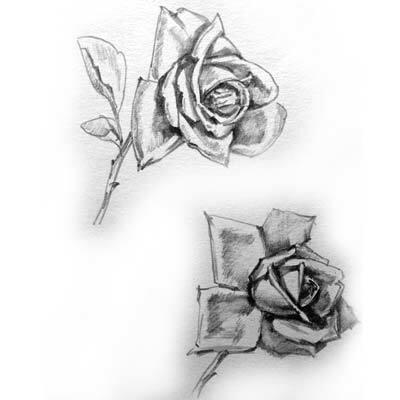 Then draw the darker areas but still with a rather lighter pencil. Any small freshwater fish will do. Again concentrate on line contour variation and add soft shading with harder pencils and lots of layering. Everyone knows Dory from the movie "Nemo". 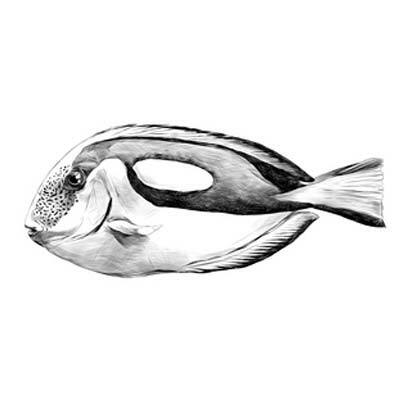 Dory is from the species of Surgeonfish and quite an interesting subject. 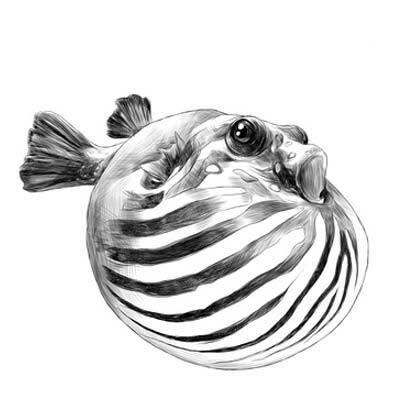 The roundness of this puffed up striped puffer fish is created through the lines running around the form, but also that those lines have light areas and dark areas in itself. Use the same technique as you did yesterday. 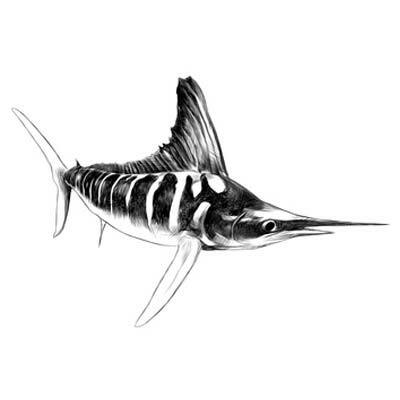 The Marlin's common name is thought to derive from its resemblance to a sailor's marlinspike and can reach up to a whopping 5 metres and can swim up to 80 km/h. These little cuties are from the Asia Pacific area including Australia. They can live up to 12 years. Use same technique as yesterday. 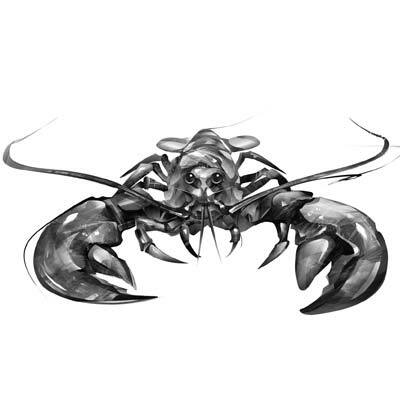 This lobster drawing receives its attraction from its low key application of its rich tonal values and yet I recommend lighter pencils for all mid and light areas of the drawing. The lobster appears shiny by leaving sharp edged highlights that remain untouched. 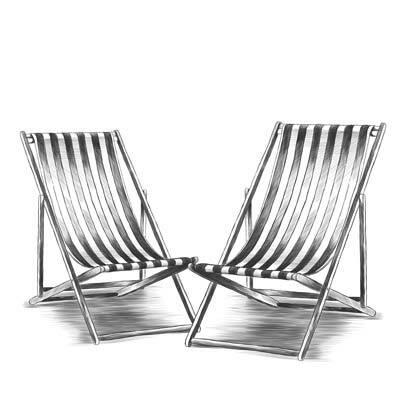 These are the decking chairs I have been growing up with which were very popular in the 60's. Flowers give an endless supply for a subject to be drawn and teaches to observe the folding and bending of a form in this case the pedals. And again a rose is today's subject. Study what makes a leave bend concave or convex to make the form of the pedals realistic even if drawn in a rather simpler fashion. Today we are drawing the desk we are working from with some of the drawing items we are using. 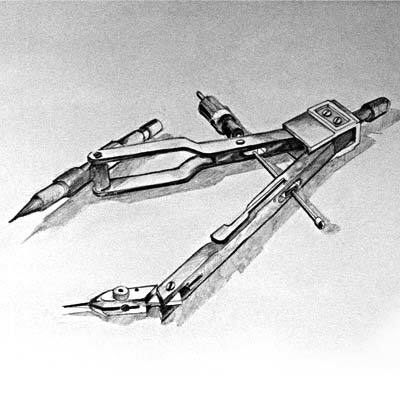 Today I want you to draw some simple shapes by using cross-hatching with different pencil grades. Start with the lighter pencils today and add the darker ones wherever needed. Try not to use your wrist for movement but use your whole arm. 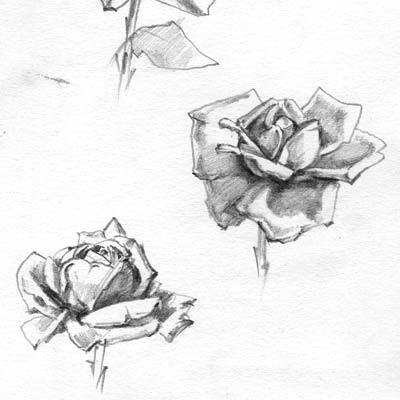 See this as an exercise for applying strokes rather than trying to achieve a perfect drawing. 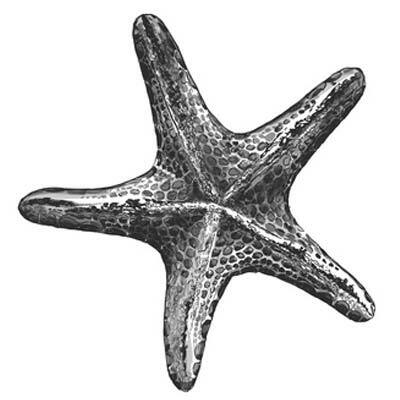 Today I want you to draw a very detailed starfish depicting all the different textures and shadings. Make sure that you have all the varied tonal values rather as most beginners don't observe the full contrast that a subject provides. So make sure you have some almost black areas as well as complete white and many different layers of grey in between. Although almost transparent, the jellyfish can be drawn by depicting its particular shapes boldly. 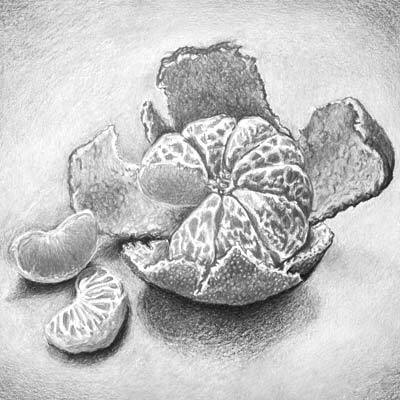 Use a mixture of layering and crosshatching with both dark and light pencils. If you have a smaller table or coffee table, place any items you may wish to create a still life. Just by doing this you fill a whole year of drawings. 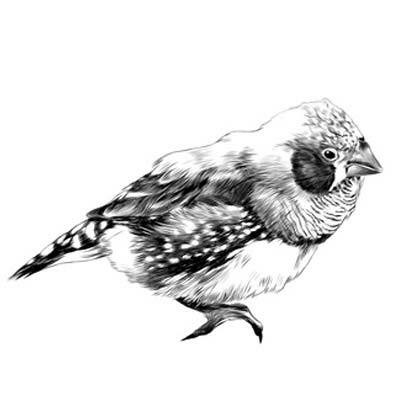 Always think about your composition by letting some items overlap and others placed apart from the other objects. 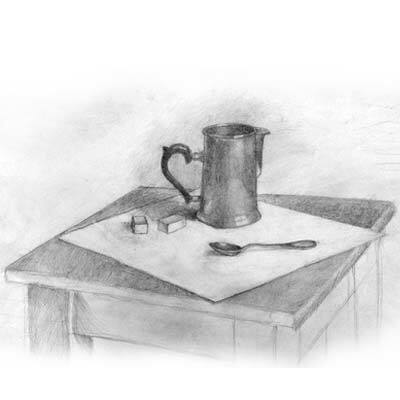 Uneven numbers of objects is preferred, in this case the fifth item is the place mat itself. 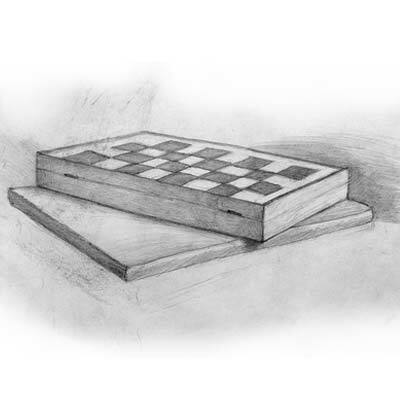 Draw a check board at an interesting angle using a two point perspective. 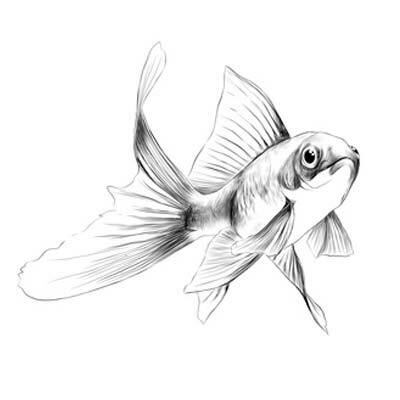 You might want to give the background a graphite wash, which means you are allowed to smudge the graphite with a paper stump, which I usually do not like doing as beginners often smudge their drawings because they can't achieve the result they want by just drawing. But sometimes it can be used as an under drawing to enhance the effect. 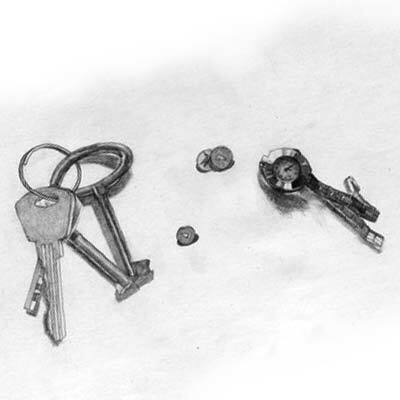 Today we are drawing our car or house keys and can add a watch and some other smaller items we might have in our handbags or pockets. 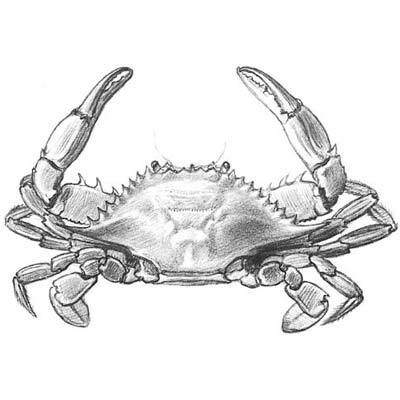 Today we are drawing a simple crab. Did you know that there are over crab 6,793 species? As they have no backbones their exoskeleton protects them from predators. The smallest type the pea crab is only a few millimetres long whereas the Japanese spider is the biggest with a legs span up to 4 metres. 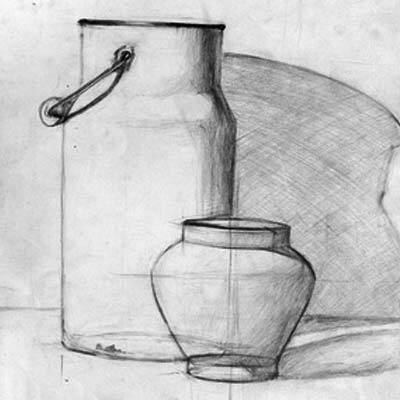 Some simple cylindrical shapes will do today, best with some interesting shading. 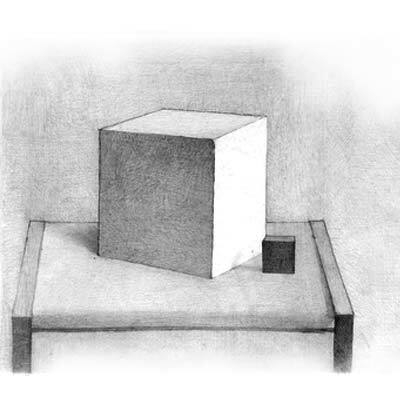 You can keep the forms simple but think about your composition. 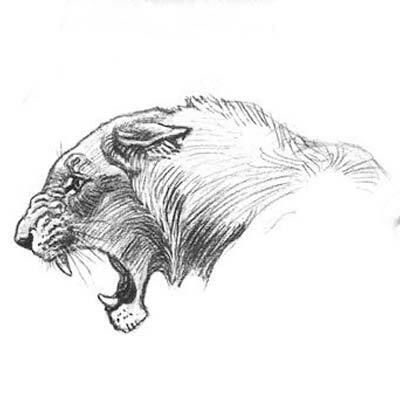 Draw a lions head from the side with simple cross-hatching pencil strokes. 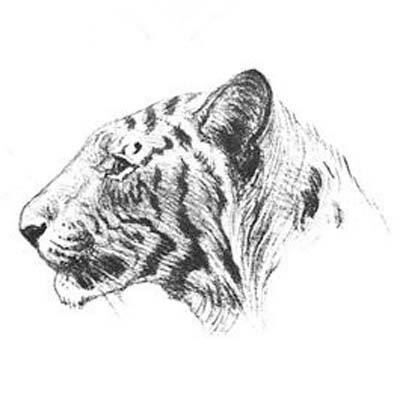 Today we draw a tiger's head from the side as our last picture for this month.